The national trend is health, and playing outdoors in nature is a natural in Tennessee.� Our most visited nation park, the Great Smoky Mountains National Park, is celebrating its 75th birthday in 2009.� Rivers for canoeing and lakes for boating, great places to swim and tube, over 800 miles of hiking trails in the Smoky Mountains alone�be sure to bring your hiking shoes to Tennessee.� Plan an outdoor adventure with a Tennessee Bed and Breakfast as your base camp each night�our delicious food will start your day in style. Evins Mill features a forty acre property that includes the western most extent of an Eastern Hemlock forest on the Upper Cumberland, lending it a mountain appeal. On the property less than ten minutes from the Main Lodge is 90 foot Carmac Falls, beneath which rests a serene swimming hole. Several hiking trails lead to overlooks of the falls and its base. Guests may fish in Evins Mill pond for bass and brim. Nearby is Center Hill Lake, one of Tennessee's most popular recreational lakes, with a score of marinas and recreation areas. 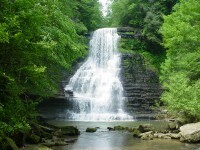 Guests can also take canoe and/or guided fishing trips down the nearby Caney Fork River. 15 Minutes from the Appalachian Trail as well as many other trails. Grow berries and other crops organically on property. There are 900 miles of trails in the National Park. What more do I need to say except that there is also, biking, fishing, tubing, horseback riding, ballooning, spelunking, kayaking, and auto touring! The first day of your arrival, or after your first breakfast on the second day, we sit down and you give me an idea of what you would like to do. I have maps and brochures, and can give detailed instructions on how to find things, shortcuts, and how much something might cost. If you are hiking, all you need to bring are your hiking boots. Give me an idea on how long you want to be on the trail, what change in elevation and how many miles you would like to traverse and I can give you 2 or 3 choices. At that point you can read a page or two on each trail selected to narrow it down to the one for you to have a perfect day. If you'd like a picnic lunch give me a heads up before your arrival, we buy everything fresh. Hiking trails right outside the front and back doors lead up and down the mountains, into the Cherokee National Forest. Weekly guided hikes on Saturdays Sections of the Appalachian Trail - we can drop your car at one end, take you to the start and you hike back. Waterfalls, ridgeline views and more Bike the nearby Virginia Creeper Trail - bring your own or rent one. Fish, swim, boat in beautiful Watauga Lake. No big waves, no salt, no cholorine, just fresh mountain water that's not chilly! 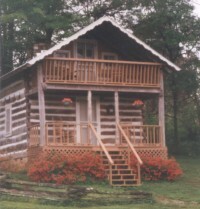 Log cabin on the grounds of historic Falls Mill. Water falls, trails, picnic area by 32 foot waterwheel. Hiking, Walking & Running- Christopher Place sits on over 200 mountain acres, so of course we have some hiking and walking of our own. But were also only 11 miles to the Great Smoky Mountain National Park (nps.gov/grsm) entrance at Cosby, the least used entrance to the Smokies. Horseback Riding Adventures are 20 minutes away and easily arranged during your stay. Hot Air Ballooning- Could there be a better way to see Smokies? Schedule morning or afternoon champagne flights. Llama Trekking- Lead one of these gentle animals into the Pisgah National Forest and enjoy lunch overlooking the mountains. Whitewater Rafting- The French Broad and the lower Big Pigeon Rivers offer gentle float trips through pristine mountain scenery. The Upper Big Pigeon boasts 5 miles of class 2,3, and 4 rapids though spectacular river gorges if you want a bumpier trip. This is one of the most popular activities in the Smokies and only happens on select days each season, so make your reservations early. Hike a waterfall trail, Midnight Hole and Mouse Ears Falls, in the Great Smoky Mountains National Park near Gatlinburg, Tennessee. We will pack your lunch if you want to make a day of enjoying this 4 mile hike with great swimming or fly-fishing in one of the most beautiful streams in America. Just 20 minutes to the trailhead over the scenic Foothills Parkway in Cosby. We include a free hiking map just in case you want to attempt Backpacker's Magazine's "Best hike in the southeast" Mt. Kammerer trail, 12 miles of adventure to the firetower at the top and back down to Cosby Campground. 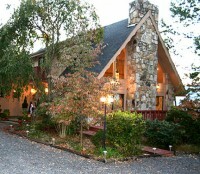 Enjoy your jacuzzi room, gourmet breakfast, house tea and home roasted coffee in our mountain lodge on the farm. 2 nights in our deluxe room, 2 breakfast for 2, one picnic lunch, trail map, $399 plus tax. This is the getaway you will remember the rest of your life. Call 1-800-962-2246 and ask for the B&B Outdoors Special.